SimplePart, an e-commerce solutions provider for OE dealerships and aftermarket auto parts suppliers, reported financial results for its third quarter ending September 30, 2013. SimplePart generated online sales for its clients totaling $3.81 million for the months of July, August, and September 2013. It is a nearly 20% increase over Q2 2013 sales of $3.18 million, and a 134% increase from Q3 2012, during which SimplePart brought in online sales of $1.63 million. SimplePart has generated a total of $9.2 million online sales during the first three quarters of 2013. In the first nine months of 2013, SimplePart has generated nearly 60% more in sales than the $5.78 million it sold for its clients in all of 2012. Customer sites saw a total of 5.8 million unique visitors in Q3 2013, up from 5.45 million in Q2 and 3.2 million in Q3 of the previous year, an 81% year-over-year increase. Order Volume, Average Order Value, Conversion RateThe increase in visitors contributed to a 106% increase in order volume and a 14% increase in average order value compared to the same period in 2012. From Q2 2013 to Q3 2013, the number of orders rose from 25,687 to 30,107—accompanied by a slight increase in average order value. An additional 8% of visitors to client sites completed a purchase in Q3 2013 compared to the previous quarter. Year-over-year the conversion rate is up 12.5%. In Q3, search engines were responsible for 67% of traffic and $2.5 million (65%) of sales. An additional 23% of traffic and 25% of sales dollars were generated through organic, returning and social media web traffic. 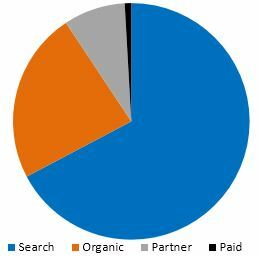 Paid and partner traffic sources accounted for 10% of visitors and sales dollars - generating $5.90 for every $1.00 spent. During the third quarter, SimplePart made significant infrastructure improvements to support the current growth that our customers are experiencing and build reserve capacity for additional growth expected over the next several quarters. SimplePart now utilizes a federated system of synchronized database servers built in-house, enabling better performance, greater fault tolerance and improved scalability. These technology improvements ultimately translate into increased profit for both SimplePart and more importantly, our customers. In contrast to our competitors, SimplePart’s horizontal scaling capabilities allow us to react seamlessly to changing demand, and our unique federated database design enables rapid page delivery, improving both end user experience and search engine ranking. Our continued investment in technology and infrastructure is a reflection of our commitment to quality and to the best possible representation of our customers’ brand.